The Ka-Zar story is just bad. Really. Skip it. But the Dr. Doom half of these issues is awesome! 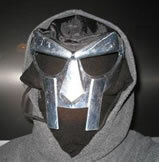 Doom goes on vacation to the Riviera-in full armor and green cloak-without using Travelocity. But it turns out, there’s a room available. While he’s gone, Red Skull invades and takes over Latveria. But then Dr. Doom gets back and it takes him almost no effort to not just scare Red Skull into fleeing the scene, but to trap him and spray him with shrinking gas, then throw his little body into a rocket. All that in under 25 pages! Thing #27-29 (1985): Team America!